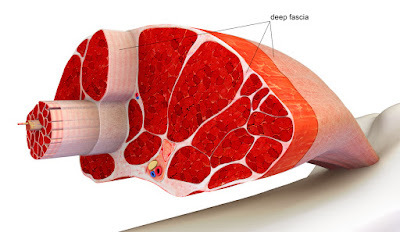 Fascia or myofascia is the dense, tough tissue which surrounds and covers all of your muscles and bones. This outer fascial covering is very strong and very flexible. In fact, it has a tensile strength of over 2000 pounds. Under a microscope, myofascia resembles a spider web or fish net. It is very organized and very flexible in a healthy state. myofascia can best be described as a complete body suit which runs from the top of your head down to the bottom of your toes. It is continuous, has no beginning or end and can be found almost everywhere in your body. Like yarn in a sweater the entire body is connected to every other part of the body by the fascia. It is a continuous weave of material. And, like a pull in a sweater, damage to an area of fascia can effect other distant areas in your body even years later. In the normal healthy state the fascia is relaxed and soft. It has the ability to stretch and move without restriction. When you experience physical trauma or inflammation the fascia loses its pliability. It can become tight, restricted and a source of tension throughout the rest of the body. Trauma such as a fall, whiplash, surgery or habitual poor posture has a cumulative effect over time and myofascial release can help. In a healthy body fascia helps to maintain good posture, range of motion and flexibility. It also gives our bodies tremendous strength and helps us deal with stress and injuries. An example of fascia would be when you remove the skin from a chicken breast, that white filmy tissue underneath the skin is fascia, and in a living state is very strong. To summarize, fascia is like a superficial body suit which allows us to move freely, breath properly and perform our daily tasks pain-free. It spans the whole body and is totally connected as one piece of material. It is called “the tissue of movement”. And one of the more effective treatments is Myofascial Release. However, there is a treatment that can effectively treat this tough, tight fascial tissue making it more relaxed, pliable and soft. Myofascial Release is an effective hands-on therapy which can directly change and improve health of the fascia. The purpose of Myofascial Release is to break down scar tissue, relax the muscle and fascia and restore good posture. The techniques of Myofascial Release are used focus on relaxing the deep tissue of the body, providing lasting and effective relief to the client. As mentioned, Myofascial Release is a hands-on technique is applied directly on the body and uses slow and sometimes deep pressure to restore the proper health of the fascia. What does a Myofascial Release treatment feel like? The pressure used can range from very gentle touch to deeper pressure. The pressure from Myofascial Release should never be beyond your tolerance and it is important to give feedback to your practitioner during the treatment. Some patients receiving a Myofascial Release treatment may experience a slight tingling or burning sensation in the skin, which is perfectly normal and safe. Others may feel a gentle to deep stretch on the area being treated. The treatment of Myoofascial Release can last from 15 minutes to over an hour. It is performed by a qualified practitioner who has studied this advanced work. These Myofascial Release techniques help to reorganize and lengthen the tight tissue allowing for better movement and health.